A 3.5 x 4 inch square corner dog care magnet is sought by pet care owners, and kennel training or care center. 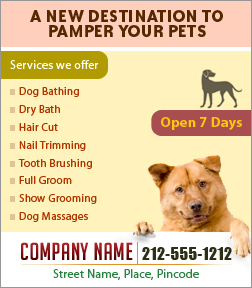 This magnet is highly affordable and it can be sought by small and big time or start up advertisers. This refrigerator magnet is affordable, which makes it a irresistible choice for all and it also makes a unique business gift in any season. Advertisers seeking it in bulk can seek benefits of lowest customization fee, free shipping, and free customization.